Sometimes we need to listen to the wisdom collective wisdom of our spiritual tradition. At other times we need to break free from the herd, and dance to the beat of our own drummer! Wisdom is knowing which one is needed at any given time in our lives. The Hierophant signals that it’s time for us to lean on the rituals and teachings that have sustained spiritual pilgrims for thousands of years. There is nothing wrong with tradition, structure, formal religious education and the like. In their proper place, they give us a firm foundation to build on. The parables and wisdom sayings in our spiritual tribe are a rich treasury of wisdom we would be foolish to ignore. Not everything needs to be reinvented. When we are feeling “unrooted” in our spiritual path, it’s important to listen to the voices of the Ancient Ones as well as our priests, priestesses, shamans, rabbis and mentors in the faith. Only a fool would ignore such a rich treasury of collected wisdom. 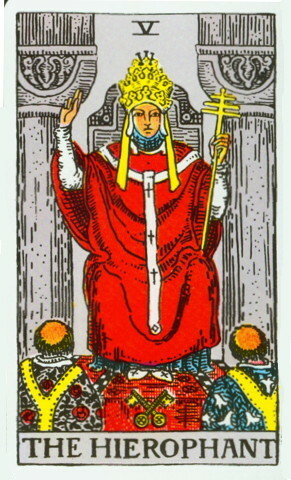 In the Rider Waite version of the Hierophant, we see a figure who looks like a bishop or a pope. According to Arthur Waite, the Hierophant wears the “triple crown and is seated between two pillars, but they are not those of the Temple which is guarded by the High Priestess.” The Triple Crown is a papal crown which can represent the pope’s three functions as supreme pastor, supreme teacher and supreme priest. Since the two pillars are not those of the Temple, I believe they represent stability and strength. Needless to say, this is a very powerful card. When it appears I take it as a sign that my spiritual life may need a little bit of structure. Now is the time to stop being a lone wolf and, instead, lean on the collected wisdom of the Ancient Ones before making any important life decisions. It’s a good time to use the spiritual traditions and rituals that have nurtured and sustained others for thousands of years. The Hierophant also tells me it’s time to seek out a spiritual community where I can grow in my understanding of the Divine Presence. 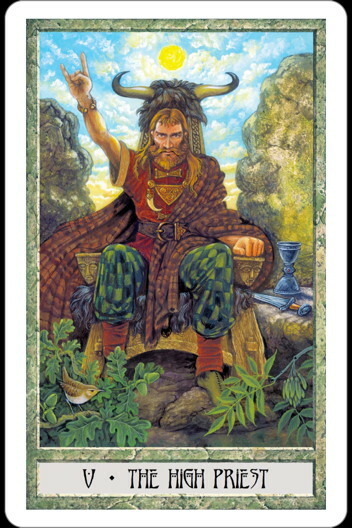 The DruidCraft Tarot reinterprets this card as the High Priest. The illustration on this card is absolutely gorgeous. In brief, he is also seated on a throne with the power of the Sun overhead, a symbol of enlightenment, vitality and power. Subtly, all four elements of earth, air, fire and water are present on the card. His hand gesture is NOT, I repeat NOT, a sign of the devil. It is the Horned God sign of blessing which is the perfect Pagan counterpart to the more Christianized Rider-Waite deck. There are many other wonderful symbols as well such as the Taurus bull horn headdress, the oak leaves and acorns which speak of power and strength among other things.